Over the past several years I have been reducing our family’s consumption of canned foods. The reason for this is that many canned foods can have detectable amounts of BPA (Bisphenol-A), a common chemical used in many plastics and also linings of cans used for food. There is more detectable BPA in canned foods that are acidic. There are a host of human health concerns linked to prolonged BPA exposure, including neurological problems, hormone disruption and cancer. In the past few years manufacturers were mandated to take BPA out of plastic bottles because of the concerns of BPA’s effects on babies and children, but many food companies still use it in cans. Some pediatric endocrinologists recommend that their patients minimize canned foods because of BPA’s hormone disrupting effects. In one recent study it was found that just one can of soup per day can raise one’s level of BPA by one thousand-fold! 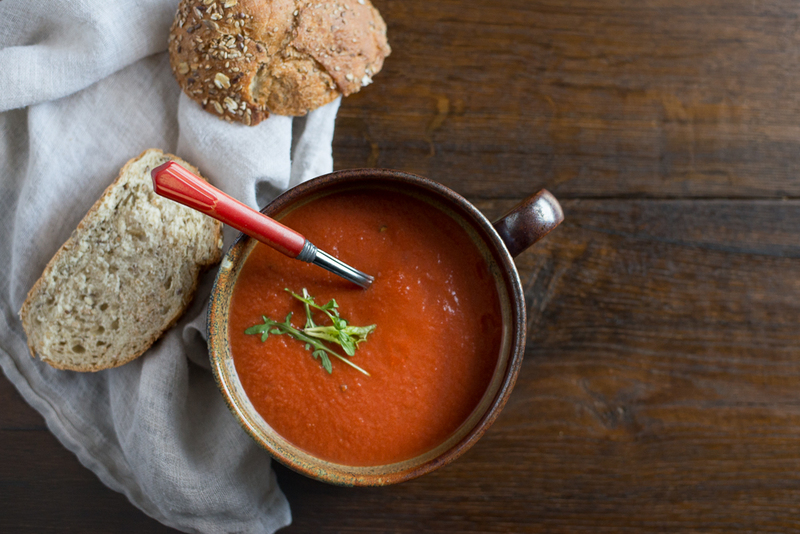 My kids and I love tomato soup (with grilled cheese, of course!) so I wanted to find a way to make this in a pinch without using canned soup. I have started keeping boxed tomatoes in my pantry for chili, stews and curry dishes. While teaching my grocery shopping class, POMI, a brand of boxed tomatoes is now being sold just about everywhere (including Walmart). The strained tomatoes in the box have a very smooth consistency, much like tomato soup, and they are BPA free! Add a few other ingredients to make it a bit creamy, slightly sweet and spiced. Warm it up and you are good to go! This is a very basic adaptation. Improvise with dried or fresh herbs for more flavor, more milk for a creamier taste, crushed red pepper for some spiciness, or whatever else suits you and your grilled cheese! Add some diced tomatoes if you want a chunkier consistency or stir in some chopped spinach to add a nutritious punch. To adapt for food allergies use a substitute for milk and butter of your choice. Have fun with it, and know that you are making a healthier version of the canned stuff! Heat all ingredients in a saucepan until boiling, stirring occasionally. Lower to simmer for 5 minutes. Enjoy!